Electrical power is key for an ICT deployment – and many other basic services as well. Yet it is often the main barrier to deployment because often it simply doesn’t exist in rural and underserved areas, or “off-grid” locations. If electrical systems do exist, they can be expensive, intermittent, and unreliable. In short, there is a shortage of electrical power in the developing world, which is holding back everyone’s efforts. World Vision International has identified the strategic opportunity to leverage its community model to develop small-scale alternative energy solutions together with strategic partners. These power solutions can provide immediate response for our basic energy needs and provide a long-term vision on sustainable models for communities to understand the technology and market trends, and own local infrastructure development roadmaps. 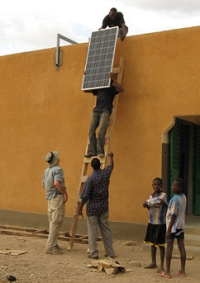 Solar Nexus International is trying to build the market infrastructure for the off-grid and grid-backup solar PV industry in the developing world, which has a natural synergy with ICT4D efforts. Both the industries need capacity building in distribution, design, installation, and service for installers and a financing and education plan for users. We’re already full – be sure to subscribe to our email list to get invites in time to join us.